Location: Weipa, Queensland and Ashmore & Hibernia Reefs, WA. Seasnakes are amongst the most venomous snakes in the world. The only antivenom for seasnake bite is produced in Australia but the raw venom required for production is in short supply. A captive population of seasnakes could provide a continual venom supply but unfortunately most species do not survive long in captivity. What is required is a species that not only provides adequate quantities of venom but also has the capacity to thrive in captivity. Mark is joined by herpetologist and seasnake specialist Brian Grieg Fry. Together they venture to Weipa in Far North Queensland, from where they can make nocturnal forays out into the Hay River estuary to net seasnakes including the Beaked seasnake, Enhydrina schistosa, the species currently used for antivenom production but a species which fares extremely badly in captivity, and aggressive Hardwicke’s seasnake, Lapemis hardwickei. 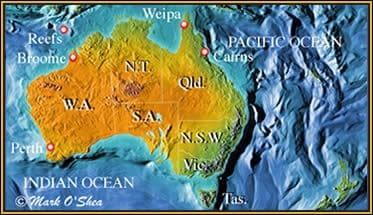 From Queensland, Mark and Brian travel to Broome in Western Australia to board the Kimberley Quest on which they journey 36 hours north-westwards to the Hibernia and Ashmore Reefs, located closer to Indonesia than Australia. Mark has learned to dive specifically to enable him to join Brian investigating what has become known as the ‘Seasnake Capital of the World’. There are more seasnake species here than anywhere else on Earth. But diving can be a dangerous business, as Mark finds out. 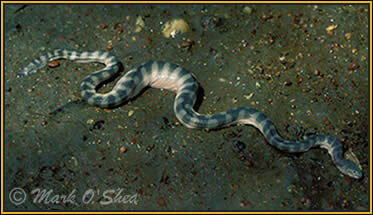 The highly venomous Beaked seasnake (Enhydrina schistosa) is an inhabitant of soft-muddy estuaries.